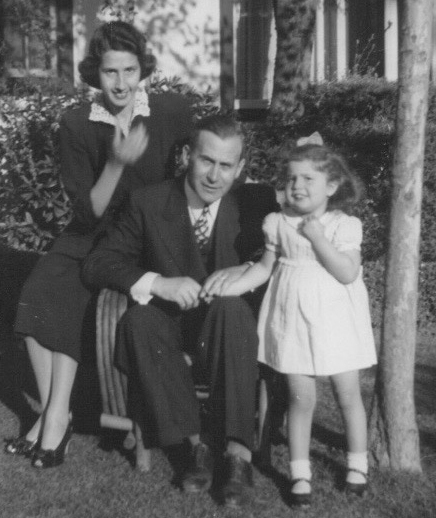 My parents Emmy Elfriede and Eugen Banzhaf’s lives included two world wars, the severe inflation in Europe during the period between the wars, the depression in the United States, and the isolation and marginalization that came with interment during the second World War. This is their story. 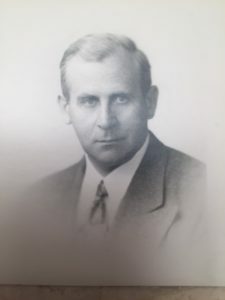 Eugen Banzhaf, came to the United States from Germany as a sales representative of a company known at the time as StahlUnion, now the ThyssenKrupp Corporation with 150,000 employees in over 80 countries. When he was sent by his company in 1927 however, he was the single US rep based in New York City. My father had a Ph.D in political science and a degree in civil engineering which made him an ideal candidate for matching products with projects. His job included what was seen at the time as frequent travel to and from the factory in Germany – approximately every two years. 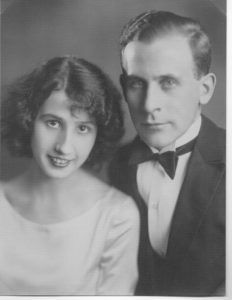 My father and mother had known each other in Germany for 8 years when, in 1929, he sent for her to come to New York to be his bride. On the day of her arrival they were married. I’m sure that I don’t need to tell you that America at the time was the land of golden opportunity and as a young couple their future together in their new home looked bright indeed. As a company rep he was sent to various locations within the US, from Austin, to Seattle, to San Francisco and finally to Los Angeles. For my parents this was an exciting adventure and a great opportunity see the vast expanse of our country. They finally settled in Los Angeles, where eventually my father set up his own company as an independent sales agent for StahlUnion. In 1937 I was born, a US citizen, in the City of the Angels. My parents had taken out their first papers for United States citizenship. Although my father traveled to Europe every couple of years on business, the pivotal trip took place in 1939, in the period just before the outbreak of the Second World War in Europe. This was to be a family visit, with wife and child in tow, as my paternal grandmother wanted to see her grandchild before she died. This trip was planned reluctantly because two years earlier on a previous business trip my father discovered that the country he had known had changed to such a degree it seemed unrecognizable to him. Frightening actually, as he described it in a letter to my mother, and he left earlier than planned. But in 1939 with a potential war on the horizon, and against the wishes of my mother, in answer to my grandmother’s bidding we three arrived as planned. Not long after our arrival my parents worst fears came to pass, the war in Europe broke out. Through acquaintances, and much wrangling, my father was fortunate to gain passage for us on an Italian liner bound for New York. The ship was full of frightened escapees such as ourselves seeking refuge from the Nazi claw. The passenger list included artists, intellectuals, Jews, homosexuals, business people, and a host of other ‘undesirables’. The majority of the passengers naturally were German. Once the ship entered international waters in the Mediterranean the French, now at war with Germany, boarded the ship and removed the all the German men, my father included, and transported them to North Africa to a concentration camp under auspices of the French Foreign Legion. The woman and children were sent back to Germany. 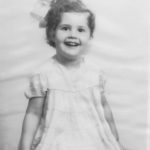 My mother, and another four women, was allowed to remain on the ship as she was the sole caregiver of an American citizen, her 2 year old daughter. The French were not at war with the United States. Our good fortune stands in sharp contrast to the fate that awaited most of the women, and eventually the men, upon their return to a Germany under Hitler. After almost a year with the help of the then Senator Alvin Barkley and some influential American friends, my father was extradited through diplomatic channels back to the United States from North Africa. My parents relief was short lived however for not long after, on December 7th, 1941 the Japanese attacked Pearl Harbor and the United States entered the war. It was on the night of December 7th that two dark suited FBI men came to our door and took my father away. That night is very clear in my memory. My mother had no idea where her husband had been taken for days afterward. In the ensuring years my father remained in an assortment of prisons and internment camps throughout the United States. It apparently took 2 years for his case to have a final hearing after which he was paroled until the end of the war in 1945. My mother remained on the outside during his internment with no source of income as all of my father’s business assets had been confiscated never to be returned, and their personal assets were removed and placed in custody by the government. Food was scarce and employment next to impossible due to anti-German sentiment that understandably flooded the country in a time of war. The entire experience eventually proved to be too much for her nerves. My mother was hospitalized on at least two occasions although she never spoke of it to me. My father informed me of that later and I do remember being placed in ‘foster homes’ for longer periods of time without my mother. Upon his release my father entered the mainstream as a former internee/prisoner of war with no job and no money. This was a very proud, educated man with an unmistakable German accent that left him open to ridicule during the last days of the war. The shame that resulted was painful to say the least and being marginalized from the community was even more isolating. I was sworn to secrecy and was told never, ever to tell anyone about what had happened to us during the war. My poor parents were ashamed of who they were through no fault of their own. I too had my challenges. When it became known in school that my parents were German, a few of the children called me a ‘Nazi-German’. Although I knew that my heritage was German it was the term Nazi that was confusing. Although I didn’t exactly understand what that meant I did know that it was something very, very bad. Historically the Japanese American phenomenon is well documented. The J/A experience eventually included entire families, and in the thousands, although some German and Italian internees chose to have their wives (or husbands) and children with them in the camps. My father did not have that opportunity, or perhaps he didn’t want the shadow cast upon him to include his wife and child. Looking back however, it might have less of a struggle for my mother had we been confined. The fact that thousands of German Americans and a few less Italian Americans were interned has so far not been historically acknowledged by the United States government. Most people are completely shocked and surprised when they learn that Germans, Italians, and other Europeans were among the interned.